who were eager to stake out their spot on any one of a number of fast moving rivers around the town. In 1832, John Barker and his brothers, Charles and Otis, bought the mill that Daniel Stearns built on the stream leading into the western branch of the Housatonic. They converted it for the production of satinet, a finely-woven cloth resembling satin but using both wool and cotton. The brothers moved quickly to expand and two years later had built a three-story brick mill 150 feet by 65 feet, one of the largest buildings in the town. New buildings went up quickly: the village bearing their name converged at the intersection of four roads around which were multiple tenement dwellings for workers, a store, a saw mill and three duplicate neighboring Italianate villas for each of the brothers. Because of the distance from the town, many of the 230 workers lived in the village and operated the 84 looms. By the 1850s, J. Barker & Brothers produced more wool and cotton than any other factory in Pittsfield. Their success allowed them to buy out D.H. Stearns at the end of the Civil War, prompting the new mill village to assume the name “Lower Barkerville.” This village occupied 70 acres on which stood two large stone factories and groupings of employee houses. The demise of the Barkers’ concern came quickly, in part due to overreach and the business cycle, but also as a result of a spectacular fire in January 1879 in Lower Barkerville that gutted one of the main factory buildings. In just ten years, the company’s demise was complete. The factory buildings were dismantled and many of the dwellings disappeared. Today, at the junction of Cloverdale, Branch and Church Streets, newer homes have replaced the factory buildings and worker housing. What does remain is one of the brothers’ villas at the beginning of Cloverdale. The quiet of this neighborhood on the southwest end of town is broken only by the sound of the stream that once powered the mills and the occasional airplanes flying in and out of the nearby Pittsfield airport. 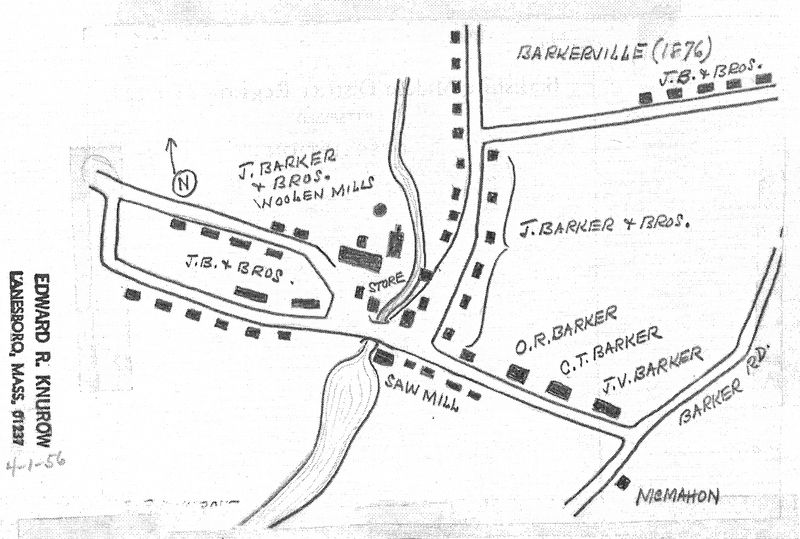 Hand-drawn rendering of Barkerville by Edward Knurow, 1956. Courtesy, Berkshire Athenaeum.